It's always interesting to look back at the past year - 2008, think about what has changed for me during the year, and think about what that means for the next year - 2009. My blog is really the hub of my thinking and activity, so by going back through posts for the 2008, it gives me a pretty good perspective on what's been happening inside my head during 2008. To do my review, I first looked at what I was writing about and what people were reading on my blog in 2008. As a side note, I used this as an opportunity to update my Blog Guide. It's nice to go back and look at some of the past articles. emerging, I felt that in 2008 I needed to find ways to help people and organizations upgrade skills like Leveraging Networks, Network Feedback, Finding Expertise, Using Social Media to Find Answers to Questions, Learning through Conversation and searching, scanning, etc. June 1, 2008 was when Work Literacy Launched. The discussion of knowledge work skills is going to be BIG ... We won't hear much this year, but in 2009, this will be something you'll hear in a big way. The fact that this is one of the general sessions at ASTD TechKnowledge is interesting way to start 2009. I had a major "aha moment" about my LinkedIn Connection Approach. Corollary - if you are reading this and are not linked to me on LinkedIn, I wonder if we are missing an opportunity. I put up a couple of screencasts that show how to use LinkedIn for Finding Expertise and Searching for Expertise - LinkedIn Answers. I'm still not sure what my Twitter Status will be. I use it a little bit. Find somewhat random things. Is good for more general, quick hit questions. Was great at DevLearn. But still have doubts, such as those in Twitter Mass Follow - Nevermind. We held our second annual Learn Trends conference. And there was a fantastic course Web 2.0 for Learning Professionals. Both were big successes. Lots of really interesting conversations. My guess is that in 2009 we are going to change the shape of the discussion to make it more frequent and narrow going forward. No reason to make these experiences be so compact. Corollary - I (we) would like to get help to organize / moderate this. I likely can create very interesting conversations and can help advertise these. Can someone help with logistics? It's safe to predict that you'll be hearing more and more about eLearning 2.0 during 2008. While large scale adoption will be slow, specific solutions aimed at particular audience needs will be more common. There will be increasing pressure on each of us to understand eLearning 2.0 for ourselves in order to apply it within our organizations (eLearning 2.0 - An Immediate, Important Shift). This will increase adoption of Web 2.0 tools by learning professionals (More eLearning Bloggers). It will also cause us to look more closely at Personal Learning for Learning Professionals - Using Web 2.0 Tools to Make Reading & Research More Effective. In some ways, 2008 was the year that eLearning 2.0 went mainstream and likely this will continue to grow in 2009. I think this has a lot to do with Corporate Learning Long Tail and Attention Crisis. Certainly in 2008, we saw lots of people are making tactical adoption - see Examples of eLearning 2.0. In Training Method Trends, we show that while still small, use of the tools is increasing very quickly. 2008 was also the year when many organizations started having Corporate Policies on Web 2.0. It was worthwhile to look at the question of: Scope of Learning Responsibility? For me, 2008 represented a pivotal year for real-time collaboration. I expect this to gather speed in 2009. As I mentioned in Real-Time Collaborative Editing and in Collaboration Tools, I had a fantastic experience participating in group editing of a Mind Map of collaborative tools during a session at Learn Trends. You can see the result below. 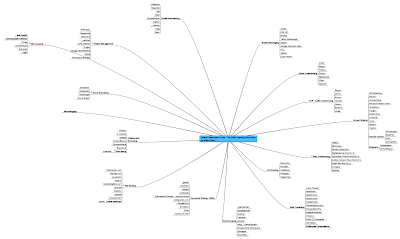 This mind map started with just the first level nodes that represented the categories. He asked people to add to those and people started typing in all sorts of things. It was very interesting to see. I've also been using a lot of Google Spreadsheets as a means of real-time collaborative editing. It's quite an experience to have a work group edit a project status document real-time. Catherine Lombardozzi introduced me to the idea of a To-Learn List. It's a list of things that you want to learn. It's been good to create a more formal list of what I want to research, blog about, use on projects, etc. This is going to be a great on-going practice. This end of year, I should create a few more longer term items to go on my To-Learn List. A new batch of Learning Communities emerged. But I'm also realizing that many learning communities form and go away - and that's okay. One of the things I didn't seem coming at all a entering 2008 was the need and opportunity around eLearning Learning. It basically takes what people in our world are already doing and turns it into a resource that adds value in terms of surfacing the best stuff. It's a bit like this post but rather than just being focused on my own blog, it uses more diverse input to form it across a broader conversation. I'm very excited with where this is going. This is going to be another somewhat disappointing year for mobile learning. While the iPhone and other mobile devices continue to proliferate and while the amount of web access via mobile devices will continue to grow rapidly (now approaching 20%), mobile learning solutions will continue to find adoption in scattered, specific examples. More podcasts and video casts for audiences with easy access, think students, remote sales forces, etc. Specialized tools for mobile professionals. But large adoption of mobile as THE learning platform still won't be there. Again, see Training Method Trends, and it shows mobile learning as the biggest loser in 2008. They will continue to get talked about A LOT. And people will continue to be interested and excited. Likely YOU will get to attend a session on them. But YOU won't get to build one, or buy one, or participate in one. Simulations and games way down as well. A medium size Virtual Classroom / Meeting Tool will announce features in 2008 that are not 3D immersive, but that are more like Mii characters in a 2.5D world. This will allow more natural kinds of interactions in classroom settings, especially for things like breakout activities. Did anyone see this come out? I'm still bullish on the concept, but maybe I'm a year or two early. Maybe 2009? It rhymes and it's an easy prediction that these two tools will dominate authoring. Interestingly, they both were originally considered rapid authoring tools but now are becoming THE authoring tools. Some lower-end, PPT + Audio tools will do well with none winning huge shares of the marketplace. Wiki + SCORM + Add-ins will become more common for easy authoring. Okay, so Captivate and Articulate are doing very well. Recent Guild research still puts them at the top, but I left out Lectora for course authoring which is a great development and packaging tool that is very close to Articulate in terms of reported usage. And in the Rapid eLearning Tools space, I left out Camtasia which is great for screencasting. Not sure that the emergence of Wiki Course Authoring really translated into adoption. And while Harbinger has provided some interesting tools that are essentially mash-ups for authoring, not sure I've seen much adoption. While we may want to use our authoring tools all the time, there's going to be more and more cases where clients (internal or external) are going to be just find with some web pages and maybe some embedded training snippets or an embedded fun Flash Quiz. Short, fast and to the point will be the standard. This will increase the discussion of the relevance of ISD / ADDIE (see also ADDIE Not Relevant?). I don't have numbers to back this up, but I'm pretty sure that it's the case that we are creating more content on web pages outside of a course and less inside of courses. Expect that will continue in 2009. My article coming out in January will spark discussion around what is actually a quite common model. And because it ties directly to metrics that matter to the business, this will get significant attention during the year. The article came out and there was no discussion. Of course, that just made me realize that I had not published the article in any usable form. Whoops. What an oversight. Large players will continue to move towards functionality in Talent Management - likely mostly features that you really don't care that much about. Luckily a few will also add in more community and wiki capabilities. Unfortunately, these will be even worse than Sharepoint, the solution you already hate. All of this will cause of to continue to ask Do You WANT an LMS? Does a Learner WANT an LMS? Wow, I'm so positive in this prediction. Largely, I think it was pretty accurate. Kevin Oakes sounded the bell in Kevin Oakes on the Rise and Fall of the LMS as large LMS vendors began to move towards Talent Management. Mzinga is going a different direction focusing on collaboration and social media capabilities. Mzinga certainly is way better as a product that my dire prediction. I'm not sure I buy what some of the other LMS vendors are providing around social software. Hey Tony! The insight is really appreciable.. I’m a huge fan of ur blog posts.. Although i’m a newbie in this e-learning industry i’m trying to make my presence felt and learn and emulate the industry veterans like yourself..
James and Susan - thanks for stopping by and commenting. James - I've added your blog to my trying out list. Susan, let me know when your blog is going. And I've got a post coming that I think will interest you as new bloggers. Great post as always Tony. Thanks for the props on our LMS direction. I agree completely on the Talent Management stuff -- analysts keep hyping this and buyers keep asking and companies never use it as designed if at all. Feels like "re-usable" learning objects all over again -- another great idea in theory that didn't translate well to real world practice. On the authoring tool front, we should show you Mzinga Publisher sometime. All the bells and whistles of Lectora, converts PPTs like Articulate, but also has built-in gaming templates and support for embedded social media -- blogs, discussions, comments, ratings, YouTube video, Google mashups. All of these elements are available in your typical asynchronous WBT course or assessment, and through them, learners can connect and share ideas with other learners. It's also a collaborative environment that allows for multiple authoring roles so you can extend the formal authoring model to SME's and even learners.